The white arrow is one that I drew to try to delineate the downward trend for pretty much all of the top ten coins in the last 3-4 days, except for Ethereum. In truth? It doesn’t mean anything. This is just Crypto being… crypto. There is a lot of speculation going around about why this is all happening. It might have been a snowball effect from a previous occurrence that just continued. 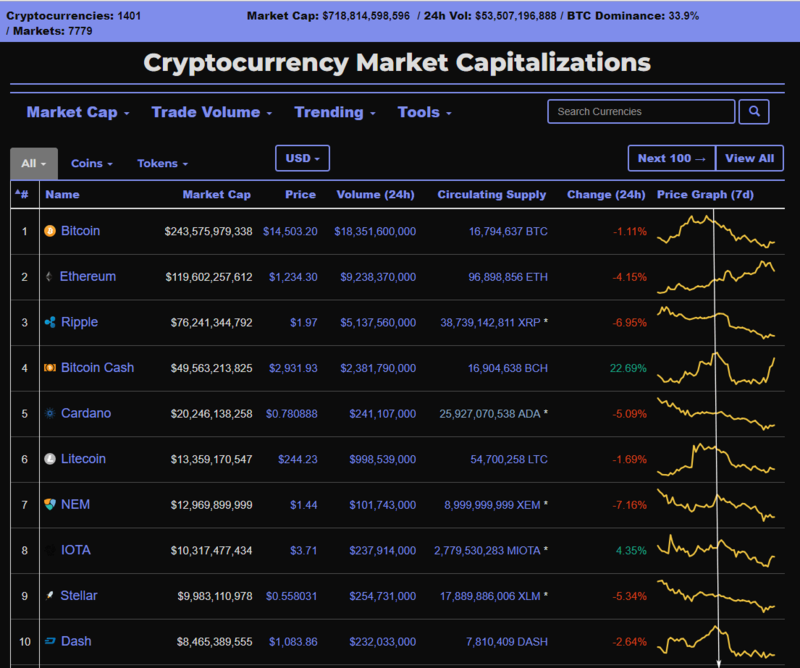 You see, on coinmarketcap.com and few other places to check crypto prices online, they stopped including the Korean exchanges in their calculations of price. Korean exchanges tend to trade at higher prices, sometimes even 20-30% higher which throws off the calculations. However, by excluding these prices, it created a “fake” decrease in the price of certain coins, especially, Ripple. The likelihood is that this led people to jump to conclusions that they needed to get out of Ripple as soon as possible or they would lose any profit they made. As such, there was a small sell-off which then led to a bigger sell-off. Then the dust settled and Ripple was down considerably. I think people underestimate just how much “whales”, ie people with a considerable amount of money can manipulate the market. Those who just “follow the trends” will never be able to do as well as those that “set the trends”. It’s kind of like how I talk about how you can’t time the market. People seem to think they can, but they really can’t. However, if you are sufficiently large enough (a whale), then I think you can affect the crypto market, especially if you have other whale friends. Let’s say you bought Ripple at $2. It ran up to $3. You’re pretty happy. Then it drops down to $2.75 or so and you’re losing some of your “profit”. Then some whales have a massive sell off of like 2 billion Ripple, dropping its price to $2.55. 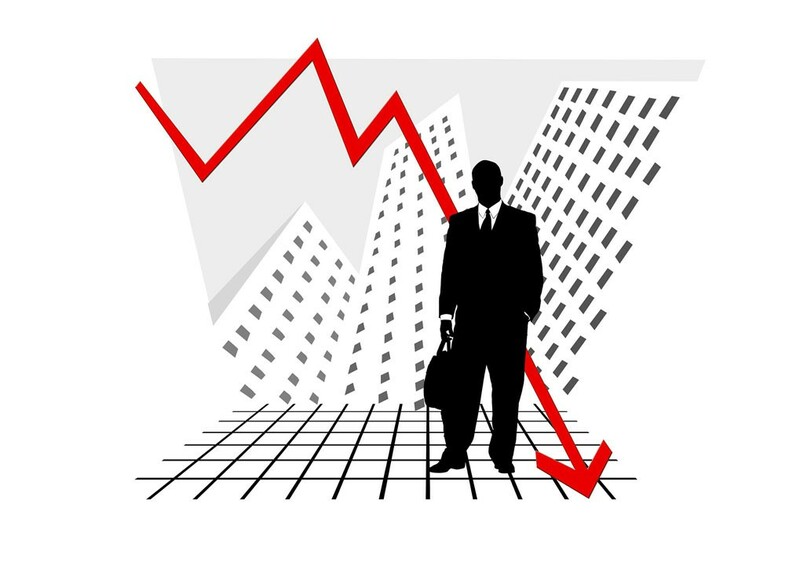 You, and about 1000 other investors like you, start to panic thinking that it’s going to drop down to when you bought, and your profits will vanish. You quickly create a sell order if Ripple hits $2.25 to lock in your profits if it came to that. Unfortunately, there are already 1000 other investors who created sell orders at $2.50 in order to lock in their profits. So Ripple continues to tank downwards until it hits your sell order of $2.25. You feel sad because you lost “all that profit”. Meanwhile, the whales are watching to see when all the furious selling will end. He/she throws out a buy order of $1.75. If Ripple hits that number. Doesn’t seem possible right? To go from nearly $3.50 all the way down to $1.75 over the course of a few days…? This is the Wild West. Not for the faint of heart. Only gamble what you can afford to lose. I have a miniscule amount of money in Crypto, although I find it very interesting. Like I said, it’s like going to Las Vegas and throwing some money on the blackjack table. For me, I can go to a blackjack table and lose $100 in a matter of 30 minutes. My wife, however, can go to the roulette table with $40 and play for hours, and usually come out ahead. At least in Cryptocurrency I can throw $100 at a coin I think is interesting and watch it for the next few years. Here’s the thing, I bought a little Ripple when it was sub $1. The chances of it going that low again are unlikely, but hey, it’s Crypto, so anything is possible. Even so, I don’t plan to sell my Ripple like ever. It just sits in my Ledger Nano S. If it goes down to zero, it’s not a huge deal for me. If it goes somewhere and becomes major crypto in the future, then maybe I can sell some and put it toward my children’s college fund or something. What other crypto do you like? I also recently answered a question on Quora about my feelings on Ripple. My speculation is/was I think Ripple will hit $5 by mid 2018. It’s been a rough start so far, but I still believe it will hit $5 in 2018. Out of my other very small holdings, I actually really like Cardano (ADA) a lot. In truth, it’s just vaporware at the moment, meaning it has lofty dreams but no product yet. However, I believe in what they are trying to create. I don’t want to sound too much like a Cardano fan boy, but I think they’ve set out do things the right way. While other coins (good ones!) are trying to fix problems with sustainability, scalability, and interoperability individually — Cardano is seeking to fix all three. The idea is that fixing one by itself won’t be enough, you really need to have all of them working on one platform in order for it to be paradigm shift. This is a massively ambitious undertaking, and the chances for failure are pretty high, much higher than only trying to fix one. However, i think they’re going about it the right way — by starting from the ground up. Ethereum is a great platform, but it has problems with scalability. When Crypto Kitties launched, it basically crashed the block chain. They are trying to fix this, but one of the major difficulties with blockchain technology is that when you build something it’s very, very difficult to change it. You decide that Ethereum should be a car. So you build the best car you can build. It’s sleek, fast, handles like a dream, has great gas mileage, and doesn’t break down. However, it’s been a few years now, and now being a jet is important… but cars can’t fly. What can you do? 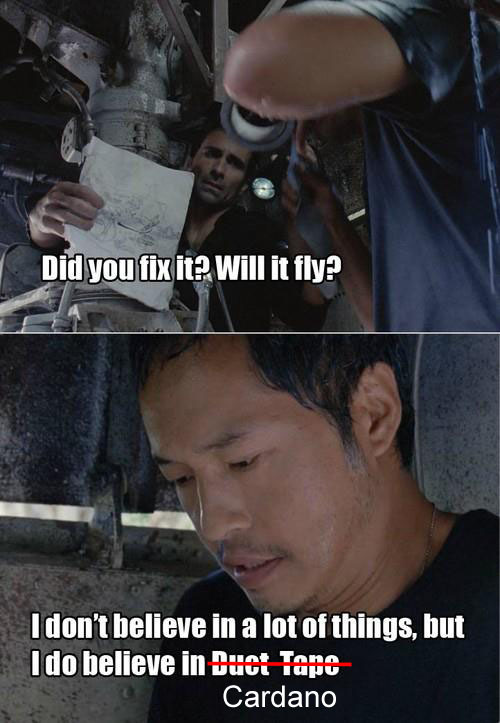 Well, you strap wings to your car, and give it a jet engine or two, and maybe pump some oxygen into the cabin. You work really hard to do all this… and now your car can get off the ground, and it can “kind of” fly. However, it’ll never truly be a jet designed for flight. It’s still a car. Do you see what I mean? All said, I may be completely wrong and Cardano may be the biggest failure to happen since Pets.com. However, I want to believe. So yea… I bought Cardano at around $0.25 as well and I’ll be HODLing it as well. I may even buy this shirt. If it goes to zero (which is possible), then oh well, it’ll have been a fun ride to watch its progress over the next few years. However, if it is able to fulfill its ambitions, I honestly believe it will be world-changing. And well, don’t we all want to try to change the world? …or at least help? For those interested in learning more, I’d recommend watching this Youtube video. It’s their CEO Charles Hoskinson talking about Cardano. It’s kind of lengthy and technical, but worth it I think. Pour some coffee and give it a watch. Whales can manipulate the market. Buy what you believe in and HODL. Only game what you can afford to lose. I don’t believe in a lot of things, but I do believe in Duct Tape Cardano.